Aku Aku in Cambridge, Mass. 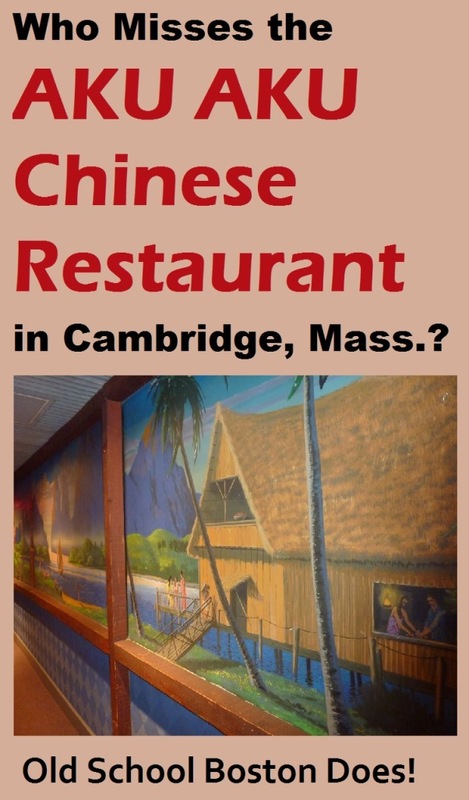 Very few people believe me when I tell them that the former Aku Aku restaurant at Alewife Station was not the first Aku Aku in Cambridge, Mass. The original Aku Aku was located on Route 2 near the Arlington line, just a few hundred yards from the former Lanes & Games bowling alley. More specifically, you might remember Faces Nightclub in that region where disco reigned as the ultimate funky town for those who liked to party and get down. You know what? That's where the first Aku Aku was actually located! I liked the original Aku Aku more than the iconic Alewife location, The dining room and bar were comfortably darker, the multi colored lights brighter and the waterways running through the restaurant lending a nice soothing feel. 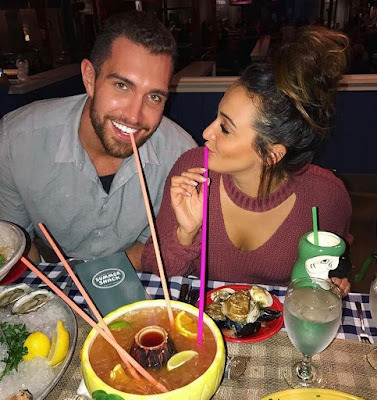 Why drive 90 miles to Barnacle Billy's in Ogunquit, Maine, for ocean water views when the Aku Aku offered their version of the Hai River three miles from home? Funny story at the first Aku Aku: My dad and his friends took a lunch break there once and ordered the numbered specials. My dad's friend said, "I'll have number one." My dad said, "Me, too." Guess what meal they served my dad? Number two! Whether the first and second Aku Aku, the pu pu platters were huge and tasty, the service quicker than competitors in a fast-serve restaurant genre, the Tolstoy-length menu dressed in clear font for reading ease, and the price always right at this old school Polynesian restaurant.. 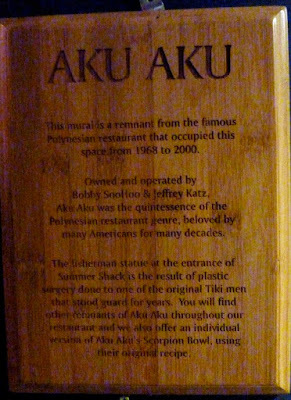 I am not clear on when the first Aku left the premises, but the Alewife location reigned from 1968 to 2000. The dining room seemed larger than Shanghai and the elbow room increased from the former Aku Aku location. It is here, I believe, that fake news got its start, also -- not from the media but the younger crowd that loved to impress their friends with outlandish stories. Here is the standard story that circulated probably better than the Boston Herald American, at this time: There was this group of young adults that chose not to pay their bill and ran out of the restaurant. Driving fast from the restaurant, the group felt they got away with their plan. Looking in the rear view mirror, however, the driver was horrified to see a maniacal Asian chef with a kitchen knife on the back of their moving car screaming at them to pay the bill. A deliberate fast turn shook the chef off the car and onto the road where the man stumbled back to the restaurant. You wouldn't believe how many people believed this story. Having an IQ over 40, however, I was skeptical. Turns out my cynicism proved right when, through the years, I heard the same story applied to other restaurants. Do you miss the Aku Aku? 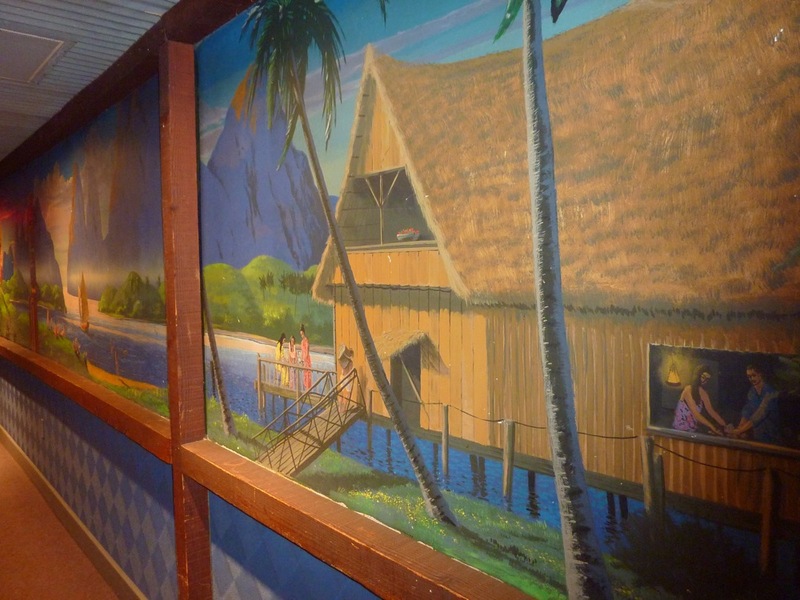 I sure do, and was delighted to find out that its successor, Jasper White's Summer Shack, kept many Aku elements including a wall mural (see photo above) and the plastic Tiki God from back in the day, as well as a commemorative plaque, at its restaurant. As seen on the plaque, Summer Shack even features, on its drinks menu, the legendary Aku Aku scorpion bowl that uses the original recipe! in Cambridge, uses the original Aku Aku recipe. Photo credit: Summer Shack Facebook page. I highly recommend you check out the Summer Shack for these wonderful remnants of a once great Chinese restaurant, but, more importantly, as a fabulous place to dine on some amazing seafood in a comfortable atmosphere. It's one of the best seafood restaurants I have been to in all of New England. The Aku Aku surely gained its most fame from the Alewife location, but let's not forget, also, the Boston Aku near Fenway Park and the Worcester spot. All were great examples of a classic old school Polynesian restaurant -- you really couldn't go wrong at any of the locations. Too bad they all closed, but isn't that the way of the restaurant industry? Just when you think you've found a restaurant for life, they close on you. Hundreds of thousands surely enjoyed the Aku Aku through the years and with good reason: They took the most beloved aspects of Americanized Chinese restaurants -- food, restaurant design, reliability and consistency-- and put it all under one roof. Many miss the Aku Aku. Me, too! What are some of your memories of the Aku Aku? Like this article on the Aku Aku? Share it on Pinterest! The Old Oaken Bucket, Westford, Mass.